We’re in the midst of our first “real” snow of the season. 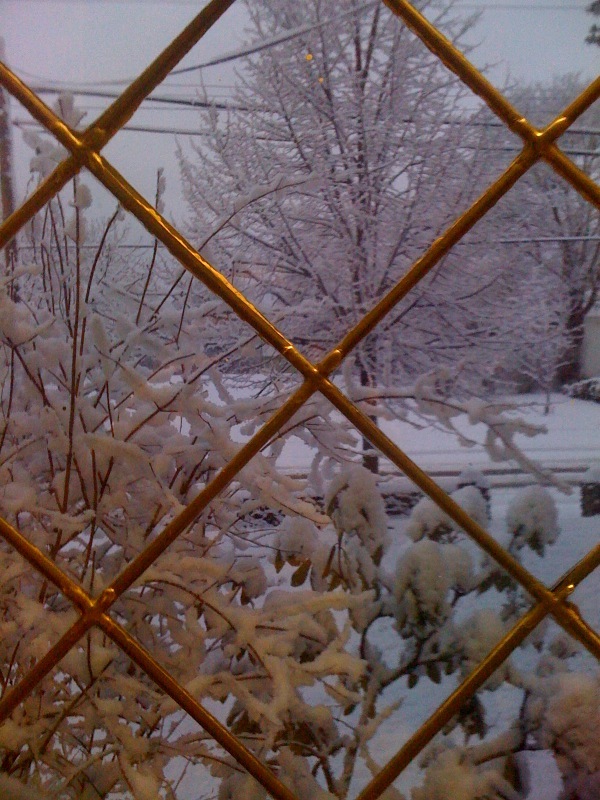 I’m enjoying the view out our kitchen window, since we are snug and warm inside. I love this time of year! There are so many fun outdoor activities to choose from and this weekend’s weather looks like it will be just about perfect: Sunny skies and forecasted temperatures of -5*C.
We are lucky, living in Central Nova Scotia, to be surrounded by fantastic spots to spend a winter’s day. Victoria Park, right here in Truro is a 1000 acre wonderland, perfect for hiking or cross-country skiing. We are always pleased to have a cozy fire for our guests to cozy up in front of after spending the day at the park! Sugar Moon Farm, just a 30 minute drive from The Belgravia, is an award-winning year-round Maple Syrup Farm. They offer tours of the facilities and also have wonderful trail through the Sugar Woods to hike, ski or snowshoe. There are weekend sleigh rides and they even rent snowshoes! Each month has its own “Chef’s Night” featuring some of Nova Scotia’s finest culinary talents. Next month, February, in honor of Valentine’s Day, they are offering this culinary treat twice – Friday, February 5th and Friday, February 12th. We have had many guests over the years who have stayed with us and then gone to Sugar Moon for the chef’s night and they always come back raving about the experience – it’s even more fun when you bring along some friends and stay with us! This weekend, I’ll be running the B&B mostly on my own while D’Arcy participates in a Curling Tournament at the Truro Curling Club with a group of other teachers. I suspect that with the exception of two basketball games, most of my weekend will take place outside on D’Arcy’s pride & joy our own skating rink. When you come to stay, be sure to bring your skates for a trip around the Belgravia’s 28′ x 45′ outdoor rink, complete with benches & chiminea! We still have tables left for each evening of our Valentine’s Dinner with Chef Daniel Creelman. Happy New Year from us to You!! Happy New Year from the McDonahs at the Belgravia! What a year that 2009 was for us!! When we weren’t busy welcoming old & new friends from around the world into our home, we had many exciting adventures. We were proud to receive two accolades this year: In March, we were named “Accommodation of the Year” by the Central Nova Tourist Association, and in November, we were named “Top B&B in Nova Scotia” by Canoe.ca. We always strive to provide the best possible experience that we can and it is reassuring to know that others feel we are achieving our goals! We closed down during the week of March Break, pulled up the carpets in our living & dining rooms and discovered beautiful hardwood floors underneath. D’Arcy refinished them himself and we are thrilled with the end product. Planned renovations for 2010 are not as exciting: fixing the section of our 105 year-old stone wall that crumbled during a rain storm, patching and resealing the driveway, and insulating the basement. Life continues to be busy on the home-front as well as with the B&B. My parents, Dave & Deanna, are well and continue to be an integral part of the Belgravia team. If it weren’t for them, we would not be able to commit to all that we do. I continue to be a member of the Board of the Tourism Industry Association of Nova Scotia (TIANS) and the Nova Scotia Bed & Breakfast Association (NSBBA). I love my positions within these organizations and am committed to encouraging others to provide the best tourism experience possible. This year saw the inception of the Belgravia Blog which can be found either by going through our website at www.belgravia.ca or directly at https://belgraviabedandbreakfast.wordpress.com . We now also have a Belgravia B&B “fan page” on Facebook, so if you’re a fan of the services we provide, please stop by and join! It can be found at: http://www.facebook.com/pages/Truro-NS/The-Belgravia-Bed-Breakfast/55069133411?ref=ts We try to keep in touch and provide information about interesting events or discoveries we have made that could be useful for trip planning. D’Arcy plans to finally graduate with his M. Ed from St. Francis Xavier University in May – the Thesis is almost finished!! We were able to surprise him last month with a coveted “X-Ring” and the afternoon off school to receive it at the Ceremony. We were thrilled when he received a permanent teaching contract with our local school board this year, attached to a job at Hants East Rural High School after resigning from his position with the Halifax School Board last year. He received his 5-year pin for being a leader in Scouting and coaches in our boys’ basketball league. The children are wonderful and we have had some exciting milestones this year! Evan won a plaque for completing all six stars in Cubs, and a gold medal in the skills competition at curling. Alex after 5.5 years of eye patching is finally finished! His vision sits between 20/50 and 20/60, but his eye “knows” how to get to 20/40 so we are all happy with that. He was pleased to pick up a couple of new ribbons for his collection at the Truro Music Festival this year. We delayed Sarah from starting school for an extra year due to her Fall birthday, but she stays busy with preschool, highland dancing & ballet. Olivia went an entire year without anaphylaxis and had a number of food challenges: shrimp (pass), strawberries (pass), blueberries (pass), grapes (pass), cinnamon (fail), pineapple (fail) and DAIRY (PASS!!) She still battles allergies to peanuts, treenuts, egg, soy, cinnamon and some fruits, but her allergist feels she will eventually outgrow all with the exception of peanuts. We can live with that! We did manage to get away ourselves a few different times this year. We spent the long weekend in May in Halifax, where D’Arcy & I and the boys participated in the Bluenose Marathon. I ran my first 5k race and loved it – the energy & excitement was palpable. We intend to run the 10k this year and the boys will run the 5k. The kids also participated in the Not-Since-Moses run in Five Islands to kick off our summer vacation. D’Arcy & I would like to run that one this year as well, but registration sells out quickly. Our nephew was married in Halifax in August so we made a vacation of it and spent a day along the waterfront playing tourist. At the end of August, we took off in a 29’ RV to PEI for five days (my parents moved in here and ran the B&B). I had “won” the RV Rental in the silent auction at the TIANS Conference. Everyone agreed that our RV vacation was one of our best vacations ever! Our garden thrived this year and we fed our guests with its bounty as often as possible. We also joined Club Salad Bowl Gardens, a community sponsored agriculture initiative. Every Tuesday, for 18 weeks this summer, they would set-up in the Belgravia driveway and deliver boxes of organic produce to members. We certainly had many interested guests and we will definitely be joining again this year! Our Christmas “break” has been a busy one, surrounded by friends & family. We have had time to recharge and are ready for another busy year of welcoming guests and friends from far & near. 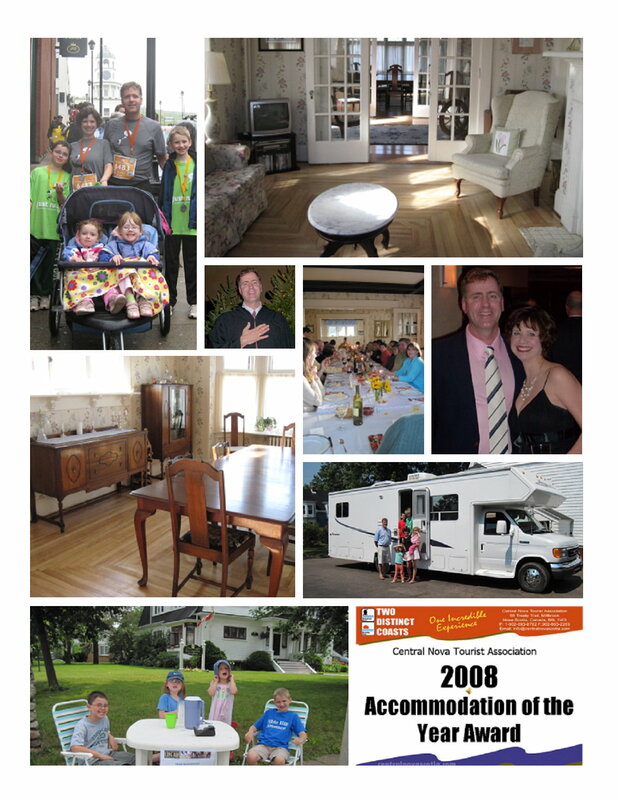 We have great expectations for 2010 and are already getting reservations for summer. We wish you, our treasured colleagues & guests a prosperous New Year. You enrich our lives and we are thankful everyday for the life we lead.